Romsey Mechanics' Institute. Original building 1875, rebuilt in 1884, current building 1904. The Mechanics’ Institute movement began in British urban industrial centres in the early 1800s. A “mechanic” was a person applying skills and technology. During the 19th century, most towns in Victoria established a Mechanics’ Institute or Athenaeum with a library and meeting hall. Common objects were the “spread of useful knowledge” and provision for “rational recreation” in the community. 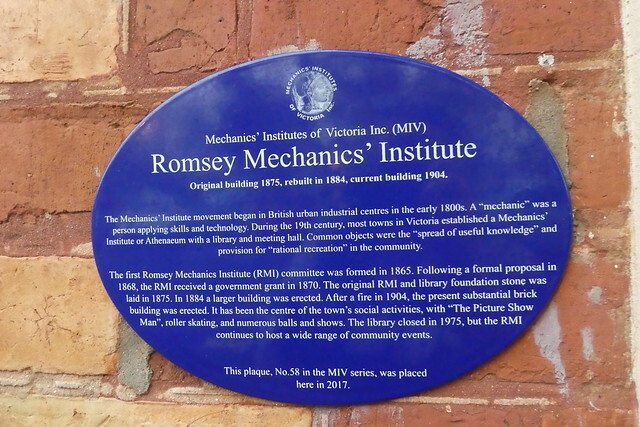 The first Romsey Mechanics Institute (RMI) committee was formed in 1865. Following a formal proposal in 1868, the RMI received a government grant in 1870. The original RMI and library foundation stone was laid in 1875. In 1884 a larger building was erected. After a fire in 1904, the present substantial brick building was erected. It has been the centre of the town’s social activities, with “The Picture Show Man”, roller skating, and numerous balls and shows. The library closed in 1975, but the RMI continues to host a wide range of community events. This plaque, No.58 in the MIV series, was placed here in 2017.